The other night we had a family celebration. We exchanged presents, reminisced about this day two years ago, cooked a special meal and for dessert we had panettone. Yes, that soft spongy fragrant cake, studded with raisins and candied fruit which Italians traditionally have after midnight mass on Christmas Eve with a cup of hot chocolate. And which I simply can’t get enough of. I was utterly pleased with myself when I spotted a stand with luxury panettones in a specialist store for sweets and sweetbakes here in Vicenza. It being the middle of October and all, I wasn’t expecting the traditional Italian Christmas cakes to hit the stores for another month. So, I immediately grabbed a loaf and that same evening I triumphantly served it to round up a great roast. ‘Mmmm, look at these Italians, selling panettone in October!,’ my husband jokingly said while we were devouring large slices of it. Now, the thing is that panettone is sold in Italy only close to Christmas. Around the middle of November the shops here start stocking a large selection of panettone cakes in their colourful boxes. 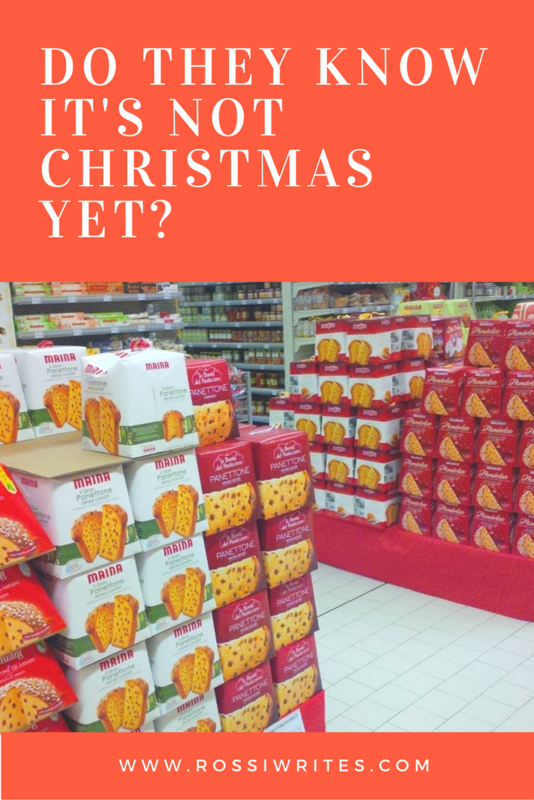 People buy them to give as presents, to indulge in a slice or two during the Christmas celebrations or, if you are like me, to delight in panettone every day for as long as it is available. Yes, in England the Christmas frenzy starts earlier and earlier each year. By October the shops are already stocked with the full range of Christmas food and desserts. Newspapers and blogs start publishing gift guides and give advice as to which ones are the best ranges of festive food to buy. Each festive season there is a new must-have product which immediately gets sold out and countless of articles and news pieces are dedicated to it. One year it was a Christmas cake made with a whole orange inside it. It was quite the status symbol to have been able to buy it and serve it at your festive table. The rest of the year, traditional Christmas desserts (think mince pies, fruit cake and the like), believe it or not, are still available. It is just that they are sold in a different plainer packaging and under simplified names omitting all festive connotations. John Lewis’s new Christmas ad?! Apparently this is now considered to be the big Christmas event in the UK’, my husband said. And, for a moment, I was speechless. Quite the achievement for me! In case you live your life outside of the clutches of shopping and retail mania, let me tell you that John Lewis is a big department store with branches in several English cities. It is lovely! It has a great selection of everything you may ever need, it has great customer service and it feels nicely but not intimidatingly upscale. Every year the company produces an ad dedicated specifically to Christmas. It is a touching, not-a-dry-eye-in-the-room, deeply emotional, advertorial feast. A triumph of perfect marketing. Or as the locals call it ‘a weepy’. I must admit that in my time I have loved and adored one or two of these adverts. Especially the one with the snowman overcoming obstacles like a blizzard, a flock of sheep and heavy traffic to reach the nearest John Lewis and buy his beloved snowwoman a red scarf and some gloves for Christmas. I have always loved Frankie Goes to Hollywood’s The Power of Love which was used as the tune for said ad. Now I hear the powerful intro, the heart-melting wail ‘Ai, Ai, Aaa…. Dreams are like angels, they keep bad at bay, bad at bay….‘ and like a Pavlovian dog, I am reaching for my wallet. Such has been the success of John Lewis’s Christmas ads through the years that other retail companies started jumping on the wagon with their own festive tear-jerkers. The type that make you feel so deeply touched, so overcome with emotions, that for an instant, amid the tears and the sobs, you feel so good and pure inside. So warm and fuzzy, so clearly understood. So motivated to take action. To the point where you completely forget that what you are watching is simply an ad. A device to entice you to buy something. A vehicle to seduce you to spend your money on stuff. In fact, at one point in my life, I was quite serious about applying to a film school in Bulgaria with the idea of directing ads as a career. I had spent the first 15 years of my life in a socialist/communist society where ‘capital’ and ‘money’ were considered dirty words and where ads and advertising as a whole was minimal. Yes, you could watch a whole film on Bulgarian TV in those days without it being sliced up by cretin commercials about washing powder and diarrhea medication. I still remember an ad from that period. It was about a chocolate bar which supposedly tasted like heaven. There was a beautiful model jumping into crystalline waters, a fine-sand beach surrounded by lush tropical vegetation. The idea was that you take a bite off the bar and miraculously you are in heaven or something. It’s just that it never quite worked this way for me. No matter how many bites I took off the bar (or many such bars in fact), the most I ever felt was a quickly dissipating sugar rush, a terrible tiredness after half an hour or so, plus rapidly expanding thighs and waist. This is what worries me about these so called ‘Christmas ads’. Yes, they are inspirational, emotive, great to watch and intuitively-made to the point of knowing just which heart strings to tug on. Yes, their purpose, pure and simple, is to shill things to make us feel good about ourselves for a moment in time. The problem that turns Christmas into a three-month long festival. The problem that makes people so stressed with all the shopping for food and presents that when Christmas Day finally rolls everyone is too busy either stuffing themselves or opening gifts to actually appreciate the day and the tradition for what they are. And the problem that often reality doesn’t live up to the perfection of the Christmas ads. Our significant other may not go out of his way to buy us a lovely present. The child next door may not notice the elderly person who doesn’t have anyone to spend Christmas with. Our festive decorations and table may not be the fancy sparkly affairs promoted by many ads. And this leads to disappointment and disillusion. And Christmas is not a happy, joyous celebration anymore. As we can’t quite live up to the standards imposed on us. Everyone decides for themselves how to celebrate it and how much emotions and resources to invest in the preparation for it. As for me, this year, just like the previous two (since we moved to Italy), I will be taking it very slowly. First, I am planning to enjoy autumn for what it really is – grapes, chestnuts, some rains, the weather getting colder and so on. Then, when Italian shops start stocking panettone, I will make sure to always have at least one at home for as long as they have it on their shelves. In December, I may panic a bit about presents, but then will do all the small shopping that I do in a day. I won’t be sending Christmas cards. It’s not really a Bulgarian tradition after all and then in Italy they don’t have a huge selection of festive cards, nor the social pressure to send one to every single person you have ever met like they do in England. Instead I will try to go to as many Christmas markets as I can and see as many Nativity scenes as possible. And when Christmas finally comes, I hope to spend its twelve days with my loved ones doing fun things. As Frankie Goes to Hollywood originally sang before selling off: Make love your goal. Are you already getting ready for Christmas? How is Christmas celebrated where you live? What Christmas tradition do you look forward to? Share with me your experiences in the ‘Comments’ section below. I would love to read them and engage with you.